Yikes! It’s already a week into the New Year. Where has the time gone? I lost a couple of days to the Virus of Death. Bill was on vacation so we were trying to knock a few things off the to-do list and get in our last bit of relaxing family time. We had such plans for Bill’s time off. We had planned on watching a couple of movies, catching up on tv. A couple of days a go, Bill said to me “I’m so glad we were able to watch all those movies.” We laughed. We did not watch a single movie. But we did watch a bit of tv, cleared some space off the DVR, and got to relax. I was thinking about my last post and realizing that despite how busy I was, I found some time for holiday crafting. 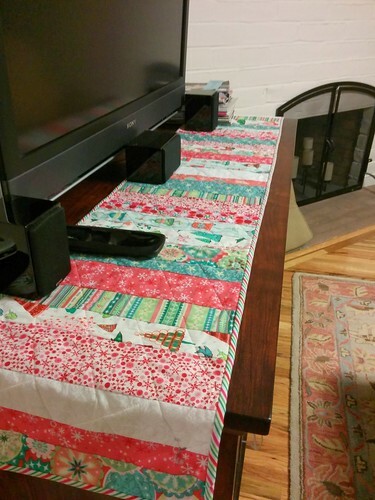 I managed a Christmas table runner. I have bought so much cute Christmas fabric over the last couple of years and I finally managed to do something with it. It’s a simple runner, strips of varying width, quilted with diagonal lines, hand sewn binding. And I managed to knit us all Christmas hats. 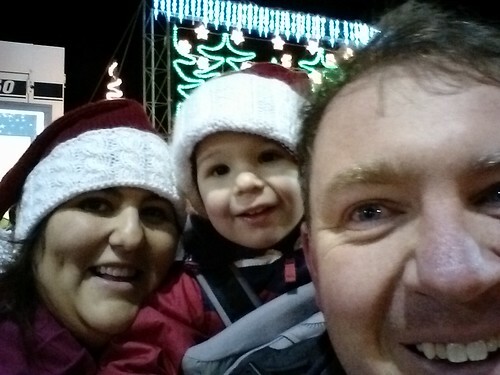 Unfortunately I don’t have a picture of the three of us in our hats, but we all have them. It was a fun knit. The hardest part was the pompom and getting one that was full enough. Bill and Joshua wore them to the farmer’s market ever Sunday in December and got a lot of compliments. Yay! Of course with the new year, I’ve been thinking resolutions, but I’m not sure I’m going to make any formal ones this year. I need to finish some from last year, unfortunately. Now that I’m thinking about it, my resolution for 2014 is to Get Caught Up. Catch up on projects I’ve had on my to-do list for a couple of years, catch up on last year’s resolutions, and projects that have been on my mind. I feel pretty good about this. Wish me luck! 5. Make more time to be outside. 11. Be a better (pet) mommy and wife. 12. Catch up on my photo albums. 13. Learn to make croissants from scratch. It’s a start. I wish you nothing but love, success, happiness, and health in the new year! 4. Write more. I got started with NaNoWriMo but didn’t come close to meeting the word count in November, but it did get my writing again and I’d like to keep it up. And now I’ll be ready for writing in November 07. 6. Start a very small business. I made a pouch that I use as a knitting organizer and I would like to try and sell them. I have to make them first! I hope everyone enjoyed their holidays and I wish you all the best in 2007! 6. Swirling with Love – In progress! The projects with a “*” are considered large projects and are not part of my new year’s resolution. In preparation for finishing my last needlepoint project, I went to the needlepoint store to get fibers for my next canvases. How exciting! These projects vary in size and completeness. Stay tuned for progress reports. Happy New Year! It’s the time of year to find areas for personal improvement. I’ve been doing a lot of reading on resolutions and have decided to look at things differently. Many of the things on my list are things I would like to change permanently. So rather than resolving to do this things, this is the year that I accomplish them. 1. I finish most of my open (in progress) knitting, needlepoint and cross-stitch projects. I have defined “most” as 75%. One of the first things I’ll have to do it inventory all my projects. I estimate having 2 knitting, 5 needlepoint and 3 cross stitch projects open. I am also going to limit the number of new projects I buy. 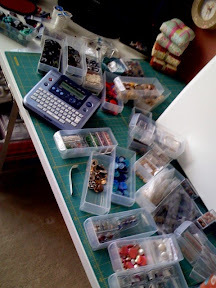 I have quite a few projects in my craft room and really don’t need to buy anything new. 2. I will conquer the clutter. I own way too much crap. It’s time to clean out the closets, clean out the drawers, clean out under the beds, clean out the garage and purge. There’s also the mental aspect of letting go of the clutter. I assign value to these things and I don’t need the stuff to still have the memories. I will figure out what is really important and let go of the rest. 3. I will spend more time with my kids: brushing Sabrina, letting Cheli lay on my lap, letting Harrison chew on my fingers, walking CJ and brushing all their teeth. They enrich my life so I will try and enrich theirs. 4. I will eat 6 – 8 servings of fruits and vegetables a day. I think this is am important first step in a healthy diet. I’m thinking more fruit and veggies will mean less cookies. We’ll see. 5. Spend more time outside. Life is too short to spend it inside doing chores. I want to get more fresh air. What I love about the new year is all the potential. This year will be what I make it. What will yours be?